Jillian Crawford was born and raised in Metrobay and grew up watching the city she loved ransacked by ruthless businessmen, maniacal supervillains, and deranged otherworldly threats. She also grew up inspired by the countless brave heroines that always seemed to rise to the occasion to save the day, time and again. While she had no superpowers of her own, Jillian was inspired to make a difference in her neighborhood by running for local office on a campaign of sweeping reform and progressive change. This earned her a lot of enemies, not least of all Max Indeks, but also won over the people’s support, allowing her to crush her political opponent. From there, she only rose in prominence, eventually becoming mayor of the city and helping establish the official government support of the Superheroine Squad. Her political success also paved the way for her to start a family, with a supportive husband and son at home who encouraged her to keep up the good fight. Jillian remained unsatisfied, however, and reluctantly gave in to the pressure to run for state-level government, becoming Metrobay’s first elected congressional senator. There, she advocated for superhero rights and championed government aid in their crusade against corruption and evil. She advocated strongly for Vanessa Turner to fill her mayoral seat, an endorsement that carried much weight. Senator Crawford campaigned for re-election in Metrobay after her third term, returning to her beloved city only to find Mayor Turner’s behavior strange and questionable. She shared these concerns with District Attorney Heather Reins, but before she could act upon her suspicions she was tricked by the controlled Vanessa and injected with a prototype thrallium serum, rendering her amendable to Max Indek’s will. 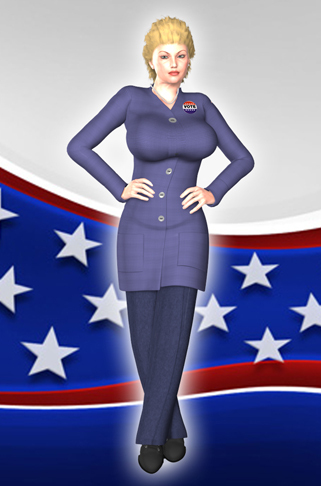 Jillian currently remains a political puppet for Max to manipulate, using her to advance his own platform to help turn the population against the Superheroine Squad. Her mind no longer her own, the once noble senator is only happy to do as she is told.